Want some nifty graphics for your mouldering scrolls and blasphemous tomes? 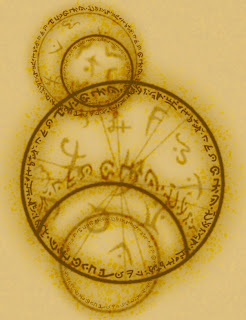 Head over to Obsidian Dawn and check out Stephanie Shimerdla's free brush libraries, particularly the "Arcane Circles" and "Arcane Runes" sets. 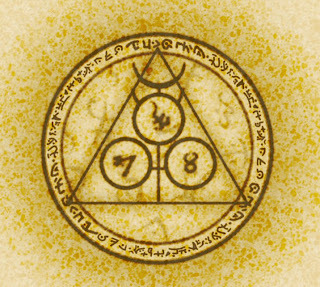 They're beautifully designed mystic symbols and diagrams that are perfect for jazzing up occult documents when you don't have enough time to do it yourself. The artwork is set up to be imported as a brush set into Photoshop, but I didn't have any trouble using the images in the included sample table in Paint Shop Pro. Just select an individual graphic, cut and paste it as a new image, and then follow the normal procedure for saving it as a tube or texture file. 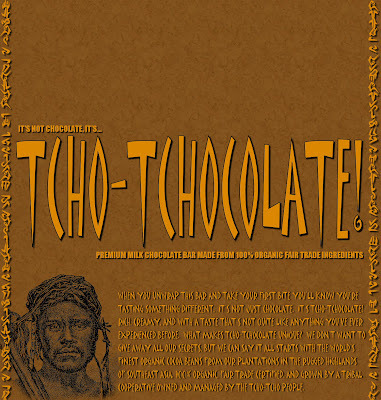 Inspired by this intriguingly named chocolate company, I present...the Tcho-Tchocolate Bar! It's sized to fit a traditional Hershey's chocolate bar. Just click on the thumbnail above to get the full-size version, print it out, trim along the edges of the graphic with scissors, fold it around a standard Hershey's Milk Chocolate bar(top flap first, then bottom flap), and give it a swipe with a glue-stick along the back to seal it up. Update: From my traffic logs it's obvious that some folks don't realize why "Tcho" chocolate is funny to "Call of Cthulhu" fans. This might help explain it. Want to get some great ideas on how to create awesome props without laying out a ton of money? Talk to a low-budget filmmaker. After all, they're trying to accomplish the same thing gamers are- maximizing the audience's ability to suspend disbelief using limited resources. Head over to The Monkey Rodeo to find some great ideas and inspiration from a guy making a horror film on a shoestring. The particular post I'm linking to has details about some great makeup effects, but if you take a look at the archived posts you'll discover some incredible props, ranging from massive weapons to arcane tablets, made with the simplest of materials. This is one of the documents I've created for COC game set immediately after the Innsmouth raid. It's based on a contemporary report (taken from the Al Capone files)from the Department of Justice's "Bureau of Investigation", the name of the FBI before it became..well..the FBI. Realistically, players probably shouldn't get the document in it's current form. 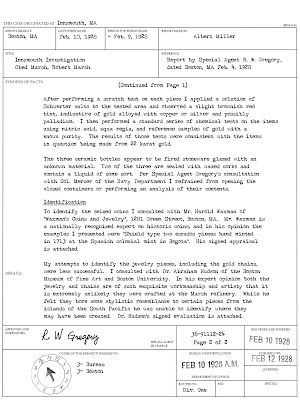 Original reports were closely tracked, hence the assigned document identification numbers, and it beggars belief that the Federales wouldn't notice that a few pages were missing from the Innsmouth file, either the BOI version or the classified one put together by the Department of the Navy. 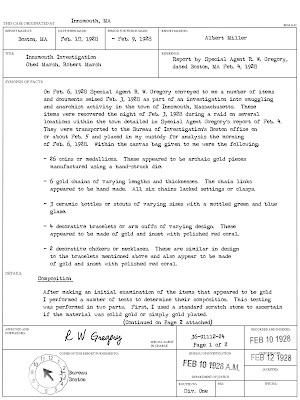 So how could investigators get their grubby little paws on the document? Photocopies. You might be surprised to learn that at least two types of copying machines existed in the 20's and 30's, both relying on a variation of traditional photographic print-making. You can find more information about the technology in the "Copying Machines" exhibit at the amazing Early Office Museum, but for our purposes it's probably enough to use an image editor to dirty up the originals with the dust specks and noise of a poor photocopy. If you're really hell-bent on realism you can print out the resulting graphic on smooth photo paper to replicate the finish of a true photo based duplication system.